Tears are essential for keeping your eyes healthy and your vision clear. 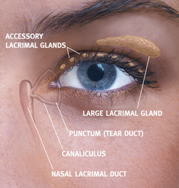 Tears lubricate your eyes and protect the cornea (outer surface). A lack of tears, improper lubrication or tears draining too quickly can lead to a condition called Dry Eye Syndrome. If not treated, dry eye causes physical discomfort and can affect the quality of your vision. through the punctum (tear ducts). 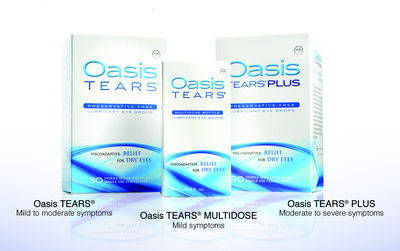 Oasis TEARS® products give your dry eyes prolonged soothing comfort by coating, moistening and lubricating ocular tissue. With each blink, they re-coat the surface of the eye for long-lasting comfort. Oasis TEARS® and Oasis TEARS® PLUS are supplied in convenient “take with you” disposable containers. Oasis TEARS® MULTIDOSE comes in a 10ml bottle. Three treatment options provide long-lasting relief for mild to severe symptoms. Our optometrist in Costa Mesa, CA can recommend the appropriate Oasis TEARS® product for your dry eye condition. If you are having Dry Eye Syndromes visit South Coast Optometry! It is important that you discuss your symptoms with our eye doctor serving Corona Del Mar, Irvine and Orange County, CA Most dry eye symptoms will remain without treatment and affect your quality of vision. Dr. Quan can perform a simple test to determine the severity of your Dry Eye and recommend the best method of treatment. Natural tears can be enhanced by using eye drops called ARTIFICIAL TEARS. They supplement the moisture that is missing and lubricate the eyes to temporarily relieve Dry Eye symptoms. It is important to use a preservative-free drop such as Oasis TEARS®. Most artificial tears contain preservatives which can damage the outer layer of the cornea when using more than 4-6 drops per day. Oasis TEARS® are a proprietary formulation of glycerin and a highly elastic viscoadaptive agent which keep the tears on the eye surface longer. When the eyelids close, the solution spreads glycerin and water to hydrate and lubricate the ocular surface. When the lids open, the glycerin and water are recaptured and retained for repeated release with each blink. When the eyelid closes the elastic nature of Oasis TEARS® allows the solution to thin and spread to cover the ocular surface between blinks. When the eyelid opens, the Oasis TEARS® solution reforms to capture and hold glycerin, lipids and water produced naturally, forming a tear film layer that stays on the eye longer.